I love meringue topping. But I’m also very picky about it. I don’t care for meringue that is foamy and when moisture pills up on it. This is typically a French meringue. I prefer a Swiss meringue. This type of meringue is thick, gooey and sticky like you could glue a gingerbread house together with it. This type of meringue resembles more of a melted marshmallow. Yummy! After doing some research from other blogs and websites I decided to keep the base of my cupcake graham flavor instead of chocolate. After all, the base of a s’mores is the graham cracker and the chocolate bar is in the middle, right? So, that’s what I did! Inside the middle of this moist graham cake I put a dollop of thick chocolate fudge. These turned out better then expected, so moist and flavorful! (I ate mine without the chocolate) This recipe, I will quickly make again! 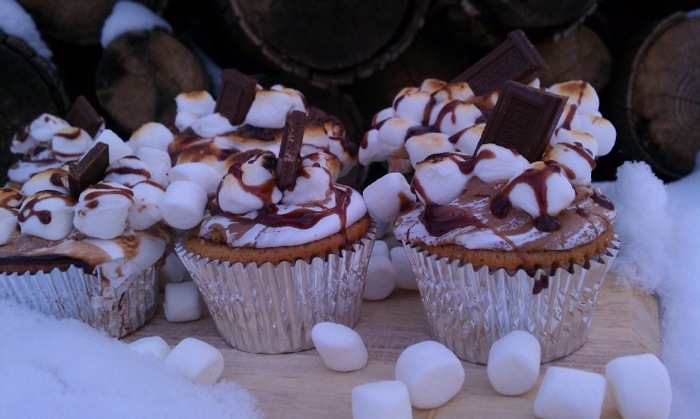 Don’t wait for summer for that campfire favorite, bake these now! The aroma when these cupcakes are baking make your house smell so sweet and cozy, you would swear you’re sitting next to a summertime crackling fire pit. These handheld treats are just as messy too, just ask Max and Rudy! 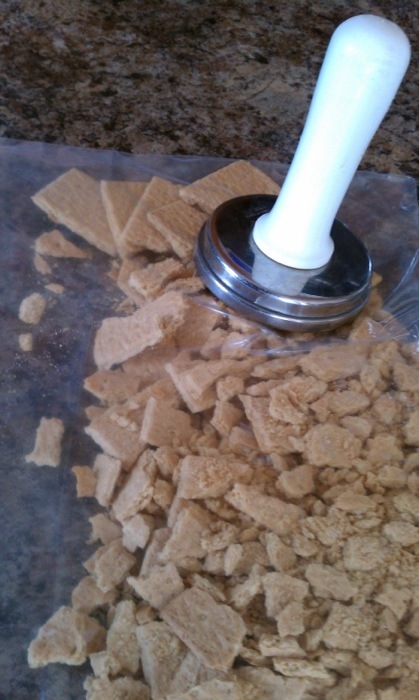 First things first; go in the pantry and get about 20 graham crackers and crush into a fine powder. 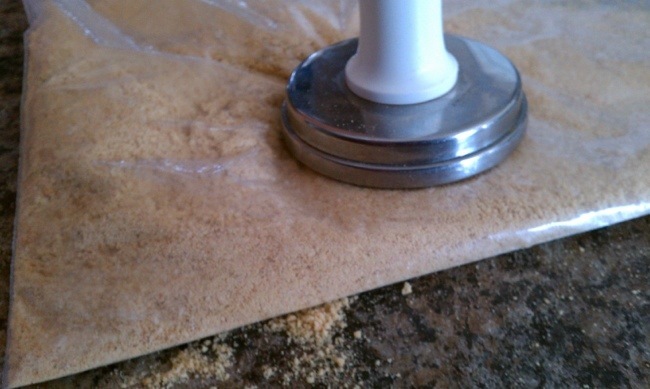 You can do this step in a food processor if you would prefer. The ziplock and meat mallet worked great for me! I chose to use my favorite sugar in the world; Muscovado brown sugar. Delish, nothing compares! This sugar was a great choice to add because it not only gave the cake the golden brown color, but it added a nice layer of richness to the flavor. This brown sugar isn’t like the “normal” brown sugar that packs in the measuring scoop. And even though this sugar is more dry, you can use it in replace of the traditional. Plus it has 10 times more flavor! You can see the Muscovado sugar in the batter. Using this sugar will leave little lumps of sugar; don’t stress over it, it’s the nature of this sugar. These little “sugar bits” melt into the batter so nicely. See the sugar specks…..? 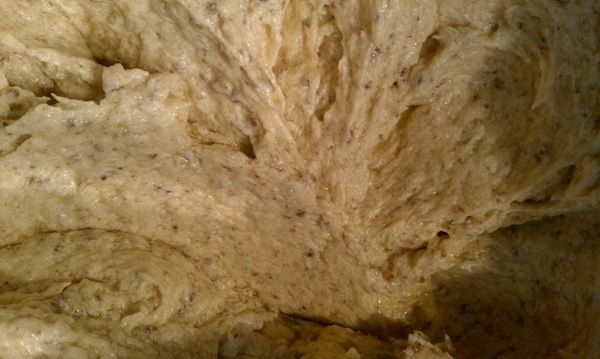 Fill and bake the batter. Don’t over bake! Take out from the oven when your toothpick test has just a couple crumbs clinging to the toothpick. 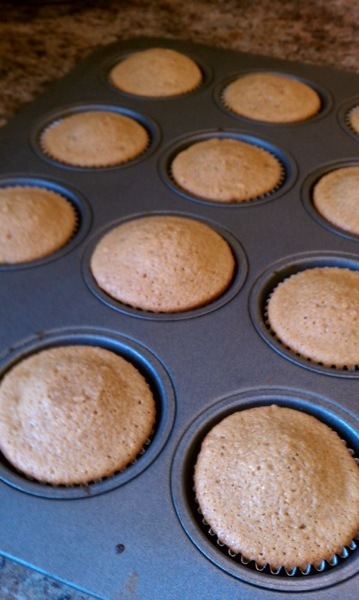 Here are the naked cupcakes! Make the meringue topping. Use a double boiler or my method is the cheaper way and just as efficient! Once the sugar is no longer grainy and the temp is about 160 degrees, remove from the make-shift double boiler and whisk until the meringue is doubled in volume. Add vanilla. Whip the snot out of it! I added 1/2 cup chocolate butter cream to the meringue and it turned out like a chocolate marshmallow. Scoop out a chunk of the cake and put in a teaspoon of hot fudge. Glaze the top with the remaining hot fudge. Homemade chocolate ganache would be ideal, but Rudy at this point was demanding my attention. I chose the quicker route! I didn’t even have a second thought on this “cheating” step! 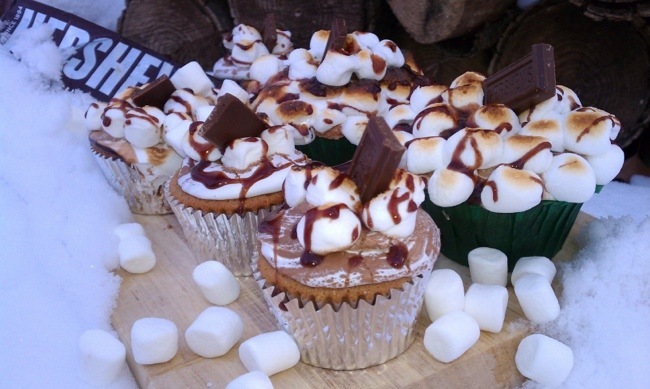 Place the meringue on top and then the mini marshmallows. Use a kitchen torch or watch carefully under the boiler. 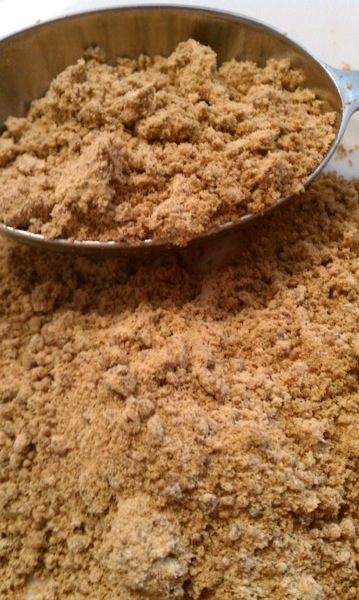 In a small bowl combine the crumbs, flour, baking powder, cinnamon and ginger; set aside. Beat the butter and the sugar in a mixing bowl until light and fluffy. Add the eggs one at a time, beating well after each addition. Add the vanilla. 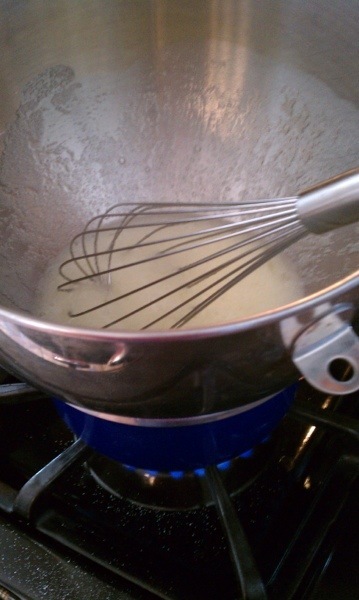 Alternately add flour mixture with milk, beating well after each addition. Divide the batter into muffin tins lined with cupcake liners. Bake at 350°F for 22-25 minutes or until done. Don’t over bake! Remove from pans and cool completely on a wire rack. 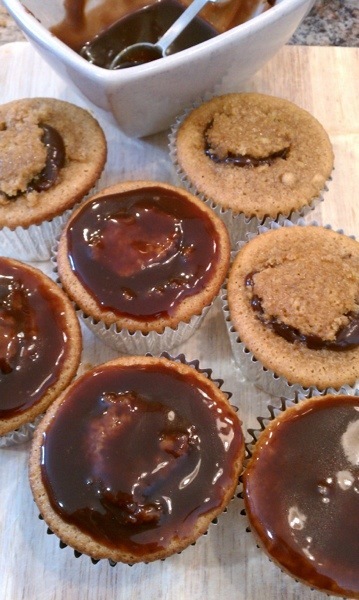 Cut a chunk out of the center of each cupcake and fill with the hot fudge or ganache. Replace the removed cake. Make Swiss meringue. Transfer bowl to electric mixer fitted with the whisk attachment, and whip, starting on low speed, gradually increasing to high until stiff, glossy peaks form, about 10 minutes. Add vanilla, and mix until combined. Use meringue immediately. Top the filled cupcake with the meringue. 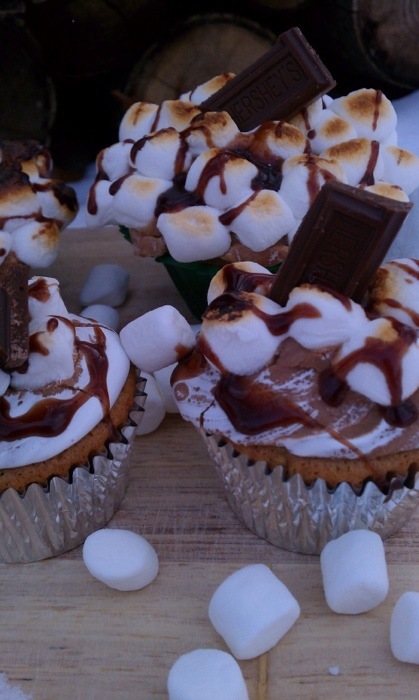 Add mini marshmallows if desired. Toast under the broiler or use a kitchen torch. Garnish with melted chocolate or a Hershey bar. Enjoy! 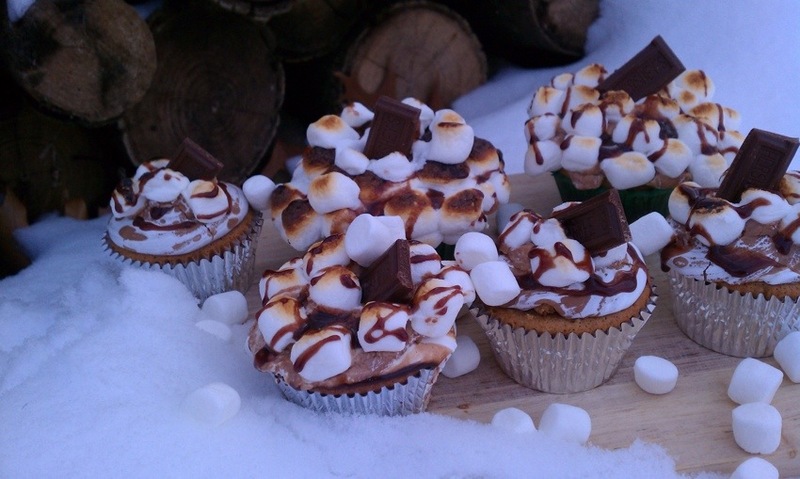 Those campfire cupcakes look extremely amazing! nice job! Those are cute. You probably don’t have extra do you ? I have about 5 of them on a platter in the kitchen.